Happiness can be a difficult thing to achieve. We are taught from a young age that we should do things that make us happy. We are taught that achieving certain goals such as graduating high school or getting that promotion will make us feel happy. But what happens when that's not the case? Or what happens when those goals get pushed back? One of the biggest misconceptions these days with the way that we work is that we believe that "once I reach _______, then I will be happy". It happens all the time. People thinking that they will be happy when they reach the next promotion, or when these upcoming weeks filled with a lot of appointments are over, then they will be happy again. The problem with this style of thinking is that the goal post usually gets pushed back. The promotion is reached, the stressful weeks at work are over, and then a new problem arises. So we end up chasing this magical creature, happiness, for what feels like our entire lives. We keep on adding new goals or new markers that we have to reach in order to feel happiness. 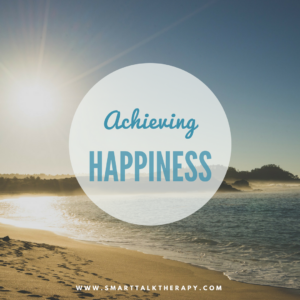 So, instead the goal should become "how can I achieve happiness now"? This is a life long question that a lot of people have asked throughout the years. It becomes an even more important question when you start to read research that supports the notion that happy people actually achieve more in terms of business success and life success than unhappy people. According to Shawn Achor's research on Harvard college students, students who were grateful to be at Harvard were more likely to achieve higher grades in their classes and do better at Harvard in general than the students who were thinking about how hard the classes were or had other negative thoughts. He found that just being grateful for what you have and just being able to recognize the happiness in those moments actually resulted in more achievement. He continues to speak about a lot of other examples of how happiness increases chances of success in his book The Happiness Advantage. Shawn Achor actually takes it a step further by providing evidence-based activities that you can engage in to be happier. Of course happiness is a subjective emotion and we should engage in activities that bring us joy and happiness. Those activities can vary across different fields and arenas. However, there are seven activities that he lists in his book that have research behind them to support an increase in happiness. We have created this lovely infographic about these seven activities for you to read through and print out. Give them a try and see which one works best for you. Try out the activity consistently for at least two weeks before judging it's power in creating happiness. These activities are like medications; they take a few tries before they start to show an effect.